A Ukranian national was arrested following the seizure earlier today. CANNABIS RESIN WITH an estimated street value of €319,000 was seized by the Revenue’s Customs Service at Rosslare today with a little help from its new sniffer dog, Ralph. A Ukranian national was arrested during the operation. The 53 kilogrammes of cannabis resin was seized when officers stopped and searched a car that was disembarking a ferry from France at Rosslare Europort. 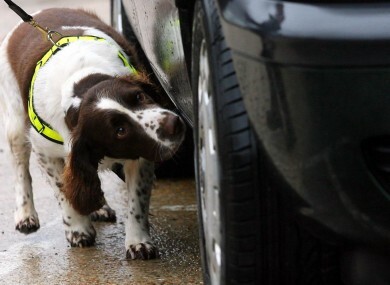 The routine profiling involved the new sniffer dog, named Ralph, who joined the Customs team fortnight ago and was able to give an indication of the presence of the cannabis resin in the car. A scan of the vehicle by an x-ray scanner led to the drugs being discovered concealed in the car. The arrested man is currently being held at Wexford Garda Station. Email “Revenue's new sniffer dog Ralph helps seize €319k of cannabis in Rosslare”. Feedback on “Revenue's new sniffer dog Ralph helps seize €319k of cannabis in Rosslare”.